As bicycling has come to account for a greater share of trips in Portland, the shift is also noticeable among deliveries and cargo hauling. Cheap, fast and classy, cargo bikes and trikes have been in use for years from Old Town Pizza to Good Neighbor Pizzeria. 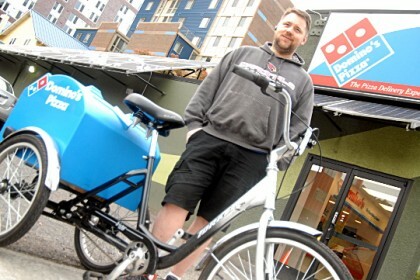 Last fall, Scott Kealer did the math and decided his downtown Portland Domino’s Pizza franchise should join their ranks. “I’ve got a corporate name on the front of the door that says ‘Domino’s,’ but it’s really my pizza shop,” said Kealer, owner of the local store on 4th Avenue near Portland State University. Unlike the delivery cars, which are owned by Kealer’s delivery workers, Kealer’s franchise owns and maintains the trike itself. Kealer saves $1.15 per delivery in compensation for his drivers, and people delivering by trike don’t have to worry about crashes, parking tickets or wear and tear on their own cars. It’s a similar calculation to the one made by the Portland Mercury when, last year, one of their delivery truck drivers successfully pitched them on a plan to switch to bike delivery on the inner west side. Elsewhere on the Network today: The Urbanophile reports that the state of Indiana is trying to fudge the numbers when it comes to the boondoggle Ohio River Bridges Project. The FABB blog relays advice from the Intergovernmental Panel on Climate Change: Local governments need to do more to encourage cycling. And Copenhagenize dives into the question of why the city’s cyclists are the world’s best behaved. Common in European cities for a long time, UPS is bringing bike deliveries to the U.S.
UPS, which uses e-bikes in more than a dozen European cities, is expanding the service in the U.S.